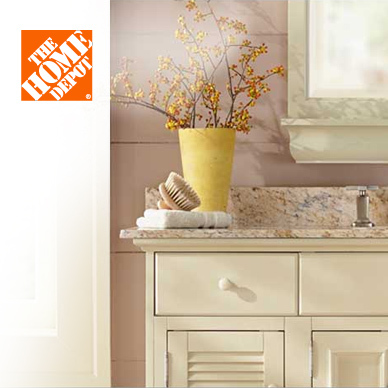 The Home Depot Sale is now on with savings across everything! From lighting for your lounge to doors for your dining room, curtains for your kitchen to heaters for your hall, and funky furniture to phosphorescent paint; The Home Depot is a one-stop shop with something to satisfy all of your DIY needs. They offer an environmentally sound service with a commitment to energy conservation, sustainable forestry and clean water. They've even given $200m in labour, money and supplies to good causes such as Habitat for Humanity. And they offer great customer service too; with free shipping available on most orders, a price promise guarantee, a customer friendly returns policy and industry leading protection plans. So all you have to do is put on your overalls, or call the workers in, and The Home Depot will provide everything else you need make your house a home! Add The Home Depot to your Favourites list and be the first to know every time they have a Sale on! 1st January 2018 - The Home Depot New Years Day sales for 2018. 7th May 2018 - The Home Depot Early May Bank Holiday sales for 2018, add to your diary now! July 2018 - The Home Depot Summer 2018 sales, joining us? 23rd November 2018 - The Home Depot Black Friday sales in 2018 start on Friday 24th November. Add products from The Home Depot to your Love Sales list. Get the Love Sales button now! The Home Depot January Sale is now on with savings across everything! The Home Depot Christmas Sale is now on with savings across everything! The Home Depot Cyber Monday Event is now on with savings across everything! The Home Depot Black Friday Event is now on with savings across everything! The home Depot July 40% off sale is now on across all appliances, including fridge-freezers, cookers, washers and much more!